Kyron McMaster, left, and his coach Dag Samuels, who’s the reigning Coach of the Year. Dag Samuels, the reigning track and field Coach of the Year, was the least surprised when his athlete Kyron McMaster, won the Jamaica International Invitational on Saturday night with a 400m Hurdles world leading time. McMaster became the first athlete this year to run the barriers under 48.00 seconds when he stopped the clock at 47.80 seconds, just .01 off Rio Olympic Games champion Kerron Clement meet record. 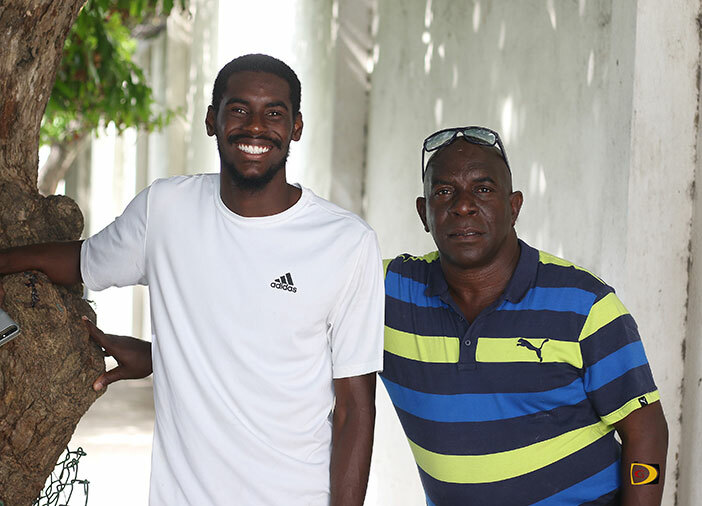 His time improves his personal best of 48.69 seconds set in Florida on April 28 and shatters his own OECS record. His time is No. 5 in the All Time in the Central American and Caribbean region, is a mark that is now No. 28 in the event, on the International Association of Athletics Federations All Time Performance List. Putting McMaster’s time in perspective, only two athletes in 2016 ran under 48.00 seconds, three in 2015, none in 2014, the same year he took up hurdling and two in 2013. Samuels’ other athlete, ASA College freshman Kala Penn, earned All American honors, when she finished third in the National Jr. Colleges Athletics Association Championships Triple Jump in Hutchinson, Kansas, on Friday, with a personal best leap. Penn who won a Carifta Games bronze medal in the event in Curacao last month with a 12.73m mark, cut the sand at 12.82m (42’0¾”) on her third attempt. Penn placed fifth in the Long Jump with her opening leap of 5.79m (19’0”) standing up as the best mark of her series. Her effort was aided by a +2.8 meters per second wind. Teammate and fellow freshman Ronique Todman, another of Samuels’ athletes, had his second best performance of the season and a non advancing time of 48.10 seconds in his 400m heat. Meanwhile, Tarika “Tinkerbell” Moses, a freshman at College of the Sequoias, was second in the 400m at the California Jr. Colleges State Championships, with a personal best time of 53.53 seconds, lowering her best from last year’s 53.72 at the Carifta Games. It’s the fastest time by a BVI athlete this season. Moses was third in the 200m, with a time of 24.22 seconds. South Plains College sophomore Taylor Hill, helped her 4x100m Relay team to a fifth place finish in 46.45 seconds, after running 46.41 in the prelims.